The following user guide is for the Metatrader Triangle/Wedge Indicator. Place the indicator onto the required chart and enter the activation code. The indicator will detect any types of triangle or wedge patterns. The default settings will be good as a start for most situations but they’ll probably need some fine tuning depending on the market and time frame of the chart. To reduce computation time the detector will process the number of bars set in the “Max. history bars” setting (see below). You can change this to a higher or lower value. When calling the indicator directly it’s advisable to set this value to zero so that the entire chart is processed. There are two processing modes. Normal and fast. Fast computation offers about 95% accuracy but is about twice as fast as normal (full line processing). This can be used on slower computers or if you are running a lot of indicators. 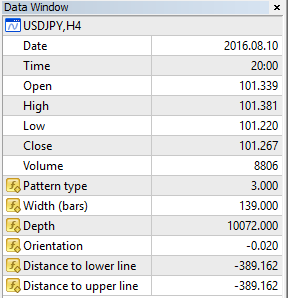 Use the “pattern type” option to select between different types of triangle or wedge patterns. The first and default option will find any triangular shaped arrangements including regular triangles as well as falling, and rising wedge patterns. As well as the graphical display the indicator outputs five numerical values whenever a triangle or wedge is detected. At other times these outputs are set to empty. The distance to the support/resistance line extends for a limited number of bars after the pattern completes. To help with detecting a breakout the indicator outputs the distances to the main support and resistance lines that form the shape. This enables you to detect when the price has broken either an upper resistance or a lower support line. This can be used to create an alert whenever either of these lines is breached by a certain distance. For a description of these values please see the introductory post on trading triangle patterns. Return to the triangle indicator product page.